Watch history unfold. Final Hubble Mission. The Hubble Telescope is being serviced in space RIGHT NOW by the crew of Atlantis.This marks the final trip to the Hubble which is expected to continue sending images from the heavens to us through the year 2014, nearly 25 years after its launch. Watch history unfold with live blogging of this FINAL service mission and video of the Atlantis shuttle crew in space. To my daughter, Story Musgrave–the man who led the first mission to service the Hubble–was a guy who thought it was hilarious to hold her birthday card upside down six years ago; to my sons, he’s simply the man who fixed our grandfather clock when he stayed overnight with us during a visit to Philadelphia several years ago. To me, he’s the ultimate Renaissance man who endured a troubled family history wrought with suicide (read the biography for details); who seeks adventure, embraces new experiences and sincerely appreciates audience Q&A sessions because he “always learns something new and important” from the public. He a true believer in the potential each and every person possesses. When I’ve expressed reservations about my role as the Science Cheerleader (“I have no formal training in science!”) he encouraged me with quips like “what the hell does that mean? Who DOES? !” And, yes, much like the astronauts portrayed by Hollywood, he’s still got an eye for the ladies 🙂 Viva Story Musgrave! 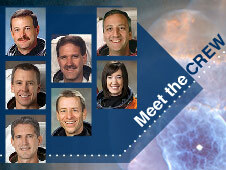 And congratulations to the crew of the Atlantis!